Wild Republican accusations have been debunked—but still they continue. Viewers learned precious little about Florida’s voter-suppression efforts that morning, but they learned nothing at all about “Benghazi”—which, as Scarborough perhaps surmised, was all Republicans felt they needed to know. The following spring, Public Policy Polling found that 74 percent of Republicans questioned believed that the Benghazi crisis and alleged cover-up was “worse than Watergate.” Of course, nearly half of them had no idea where—or even what—Benghazi was. The media’s discourse on the tragic events in Benghazi has always been ridiculous. Virtually without exception, the incident has been treated as a black mark on Barack Obama’s record as president. In their ur–insider account of the election, Double Down, Mark Halperin and John Heilemann mock the Romney campaign for failing to exploit what they term—sans evidence—“a horrendous failure on the part of the administration.” CBS’s 60 Minutes disgraced itself with Lara Logan’s foolish report when it promoted the version of these events put forth by the apparently pathological Dylan Davies, a British security contractor whose lies had already been trumpeted in a book published by Simon and Schuster, which, coincidentally, is owned by CBS. Is it the president of the United States or even the secretary of state who determines the security arrangements for our far-flung embassies and consulates? Are the numbers and positioning of guards in these places the kinds of issues decided on this level? Could it be someone else’s job to make this determination? Is this really so difficult to figure out? 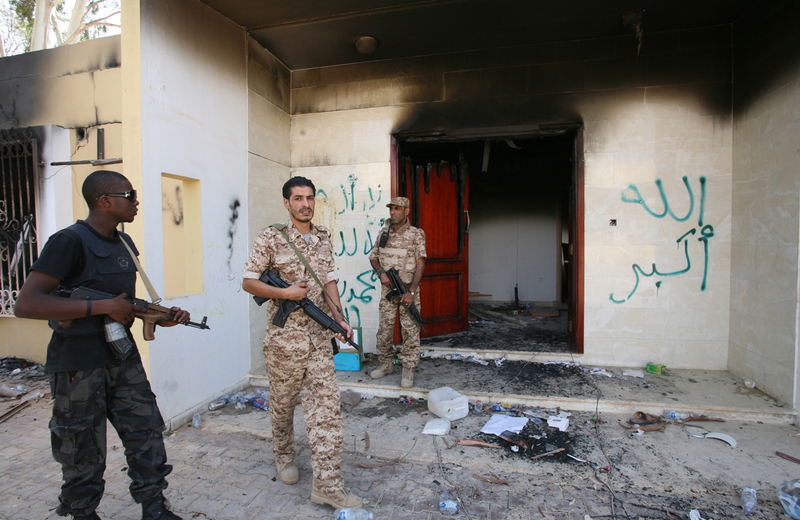 Now, thanks to New York Times reporter David Kirkpatrick, who spent months researching what happened that day and returned with a 7,000-plus-word story titled “A Deadly Mix in Benghazi,” we need no longer speculate about the essential facts of the attack. Kirkpatrick discovered evidence to discredit pretty much all of the accusations Republicans had leveled, and about which the mainstream media have obsessed. Among the most significant of these was the widely accepted narrative that the attack had been carefully planned and executed and carried out in association with Al Qaeda, rather than being a largely spontaneous popular reaction to an obnoxious anti-Islamic YouTube video that had recently appeared on the Internet. Rogers then went on to take the same tack favored by most conservative commentators and widely echoed throughout the mainstream media: that the Times investigation was merely a means to “clear the deck” for a Hillary Clinton presidential run. This careful assessment was reinforced by the Washington Post media critic turned Fox News hack Howard Kurtz, who could not bring himself to credit Kirkpatrick’s deep reporting over the “conservative commentators and Republican politicians who are taking serious issue with the paper’s report,” owing to its alleged political sympathies. Never mind that the Times famously tortured Hillary Clinton in its obsession with the trivial Whitewater real-estate transactions and all the shenanigans that led to her husband’s impeachment. Never mind that Times editorial policy is divorced from its news desk. And never mind, of course, that the Times report contained actual evidence to support an understanding of a historical event, while on the other side there is simply hot air and malicious accusation. As the liars are well aware, in American politics circa 2014, that works just as well. Meanwhile, Steve Benen of MSNBC.com notes that during the past year, ten of the thirteen most familiar faces on the Sunday shows belonged to Republicans. If Joe Scarborough, as is rumored, is given Meet the Press, television’s most prestigious pundit program, later this year, the balance will tip even further in the nutty party’s direction.